Andy Davis and Alex Warren took a clean-sweep of the second Craftinsure Merlin Rocket Silver Tiller meeting of the season hosted by Wembley SC. In second place were Chris Gould and Livvy Bell (2,16,2), and third Matt Biggs and Beka Jones (3,2,29). 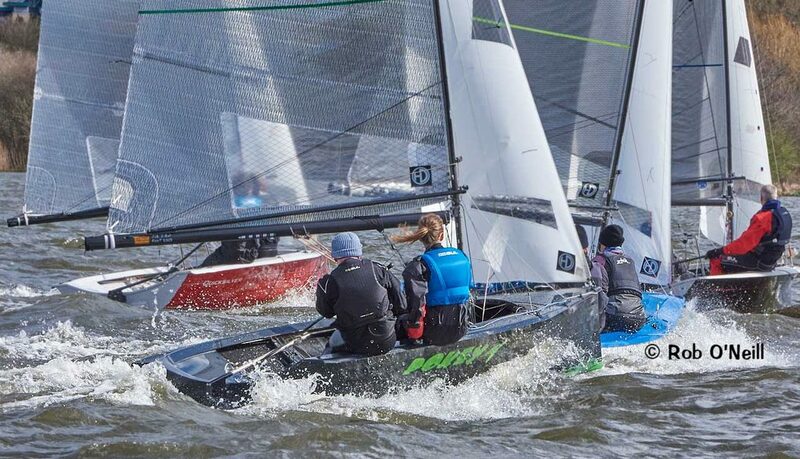 The leading crews finished three points ahead of a chasing group tied on eight points, comprising: Chris Martin and Samuel Builev, Caroline Croft and Tom Lonsdale, and Andy Dalby and Pete Horn. By way of a change from the seemingly constant storms and heavy rain, the day started with blue skies and a moderate westerly breeze of around 15 to 20 mph – although this was to change! Race 3 producing a particularly nasty squall complete with hailstones, and then another squall flattened many in the fleet leaving a large number capsized and those that remained upright a memorable white knuckle ride down wind.